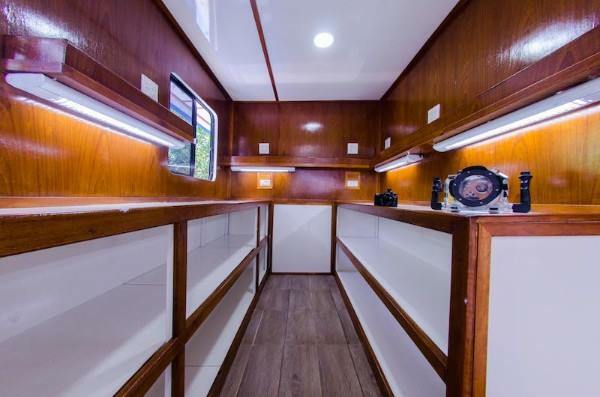 MV Smiling Seahorse is a new diving liveaboard boat for the 2018-19 season. It was purpose-built to offer safe & comfortable Similan Islands scuba diving liveaboard cruises. MV Smiling Seahorse replaces the popular MV Thai Sea that served so well for years. The new boat is bigger, but still only takes 16 guests. That means there’s more room and greater comfort. 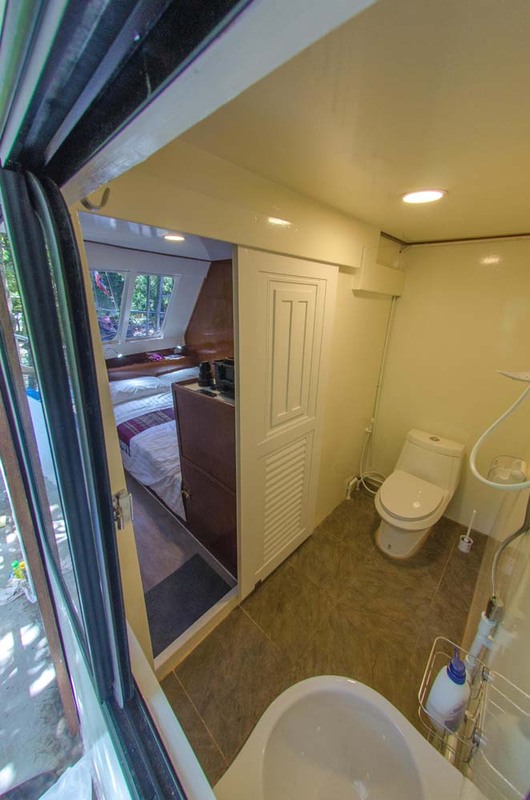 Unlike its predecessor, Smiling Seahorse has air-conditioned cabins, most of which have private bathrooms. Also the hull is steel and the engines are larger than before. MV Smiling Seahorse is an ideal size for the number of guests. It’s larger than the previous boat, but not too large. It’s 25m. in length with a width of 6.5m. This ensures that it’s always possible to find space to chill out away from others, but it also has a friendly atmosphere. The boat was designed from fresh, meaning that everything is in the right place. 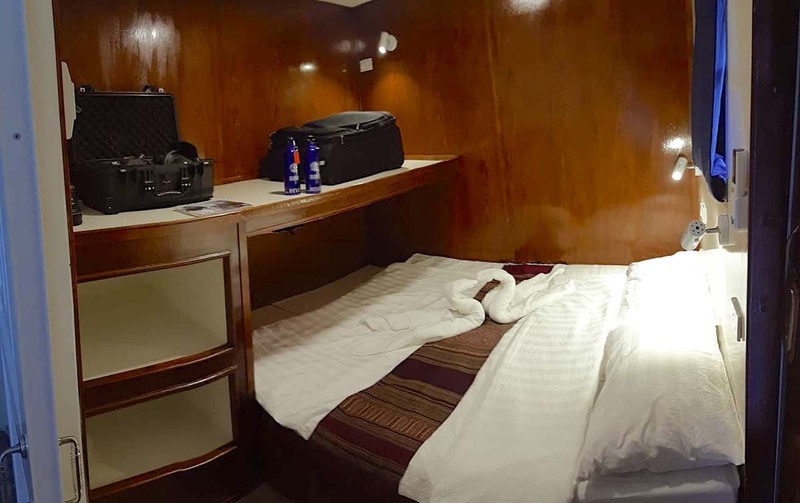 For example, the well-planned dive deck and cabin layout, and there’s a room just for photographers. From the large sundeck to the crew cabins in the lower deck, it’s a great boat. All guest cabins have air-conditioning and doors which open out to sea views, not into a narrow corridor along the middle of the boat. 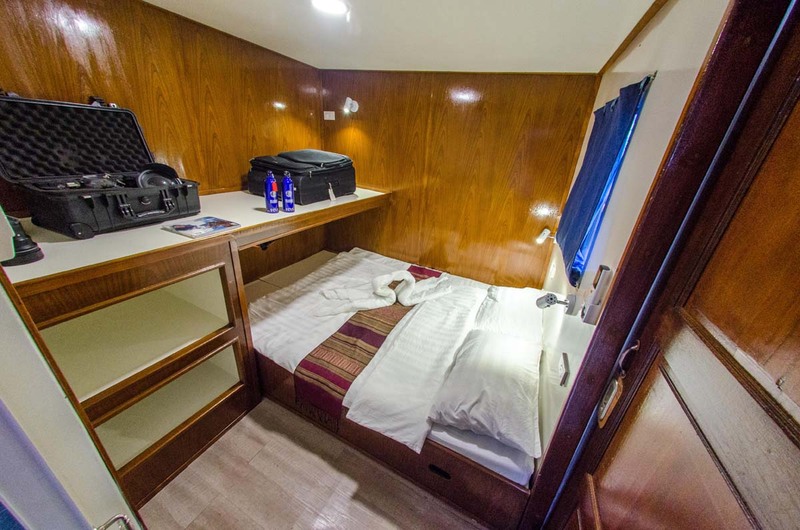 On the upper deck of Smiling Seahorse there are two ‘Superior’ guest cabins which can be set up as twin or double depending on your needs. Further back is the main socialising & dining area. This is where guests spend most of their time eating, listening to dive briefings, exchanging stories over a drink, browsing photos, reading, or updating logbooks. There are tables with lots of comfy seating, and there’s a large TV. 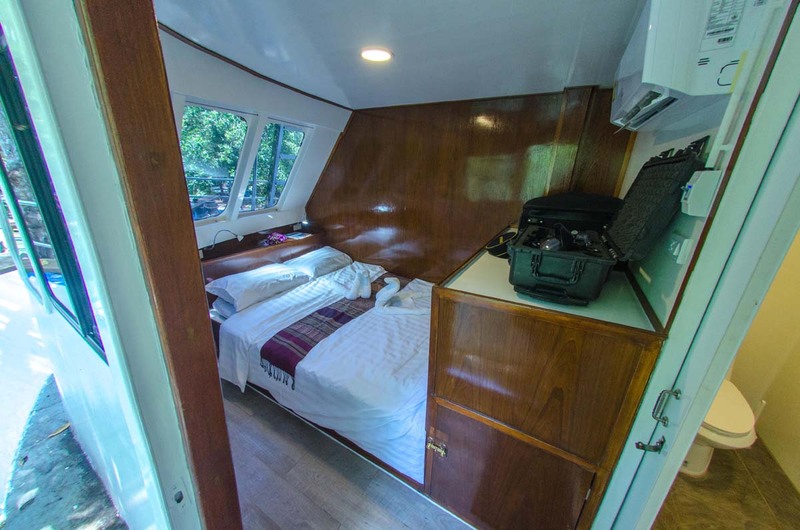 On the main deck of Smiling Seahorse there are two Master Cabins at the front of the boat and four Deluxe Cabins in the middle. 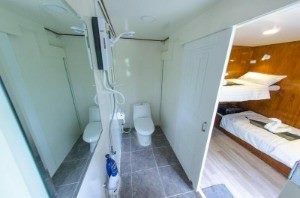 All have private en suite bathrooms. The Master Cabins have large double beds, and the Deluxe Cabins can be twin or double depending on the guests. Also on the main deck is the galley, where the wonderful cooks prepare plenty of delicious food. It’s a great balance of Thai food made to western taste. Guests who have special dietary needs, including vegetarians & vegans, won’t go hungry, but please inform any special diets in advance. There is a photography room on the main deck, next to the kitchen and communal bathrooms. This is important on scuba diving liveaboards nowadays. Diving photographers can service, clean & charge lights & cameras. On the well-designed dive deck there is easily enough room for all divers to feel comfortable when gearing up. All the tanks, equipment, compressor and other machinery is located here, out of the way. Smiling Seahorse’s lower deck has crew cabins and two brand-new large & powerful engines. These engines are ideal for longer itineraries. This ensures smooth, quick and safe crossing between dive sites. Most of the time Smiling Seahorse is in Myanmar/Burma, but several times each season there are trips that stay in Thailand. Instead of joining the crowds at the Similan Islands, Smiling Seahorse takes a different approach. 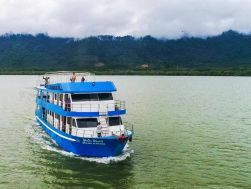 Going directly from Ranong to The Surin Islands, the divers can enjoy some wonderful dives at secret dive sites, and often visit the Sea Gypsies. Then it’s south to Koh Bon, and on the return stopping at Koh Tachai. Saving the best to last, Richelieu Rock is visited on the final day. These trips are 3 days & 3 nights, with up to 11 dives. 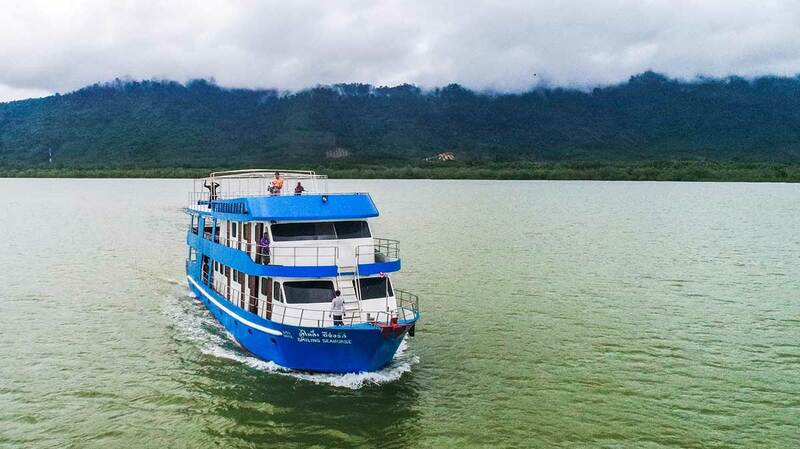 MV Smiling Seahorse trips depart from & return to Ranong. Check-in is at lunchtime or early afternoon on departure day. The trips first visit The Surin Islands, then Koh Bon, Koh Tachai and finally Richelieu Rock. 3 days, 3 nights & 11 dives. PADI Advanced Open Water & Nitrox Enriched Air courses are available on request on MV Smiling Seahorse. Some other PADI courses are also possible. Please note that it's important to ask for and book your PADI course in advance, so that the team can prepare materials and staff. MV Smiling Seahorse guests need to arrive in Ranong no later than the morning of departure day. It’s better to arrive the day before as this will give you more time to settle and explore the town. You need to sign a little paperwork and maybe fit rental equipment at the Smiling Seahorse office. Departure is soon after 3pm. Pick up from local hotels and Ranong Airport can be arranged on request. Natioanl park fees are due on arrival and should be paid in cash. The money is used to support the local authorities' protection of the marine parks.